In his debut solo show Psycolourgy, visual artist Nick Smith re-imagines iconic works by artists including Van Gogh, Magritte, Warhol and Hockney in a unique and visually arresting way. Betraying his background in interior design – Smith has an MA in Product Design and has worked for the past decade as a designer for global brands including Hilton and Virgin – Smith’s first works were created using Pantone colour referencing ‘chips’, the essential tools of his original trade. The artist’s process developed organically; beginning with a desk covered in the colour swatches which Smith arranged into ‘Tetris-like’ patterns and ending with the creation of his first work; a version of the untitled 1967 Warhol portrait of Marilyn Monroe. Over time Smith has developed a palette of his own colours; each chip being custom made and named with a word inspired by that colour and then hand applied in layers. He now works with a library of over 3,000 colours, all with their own evocative names. 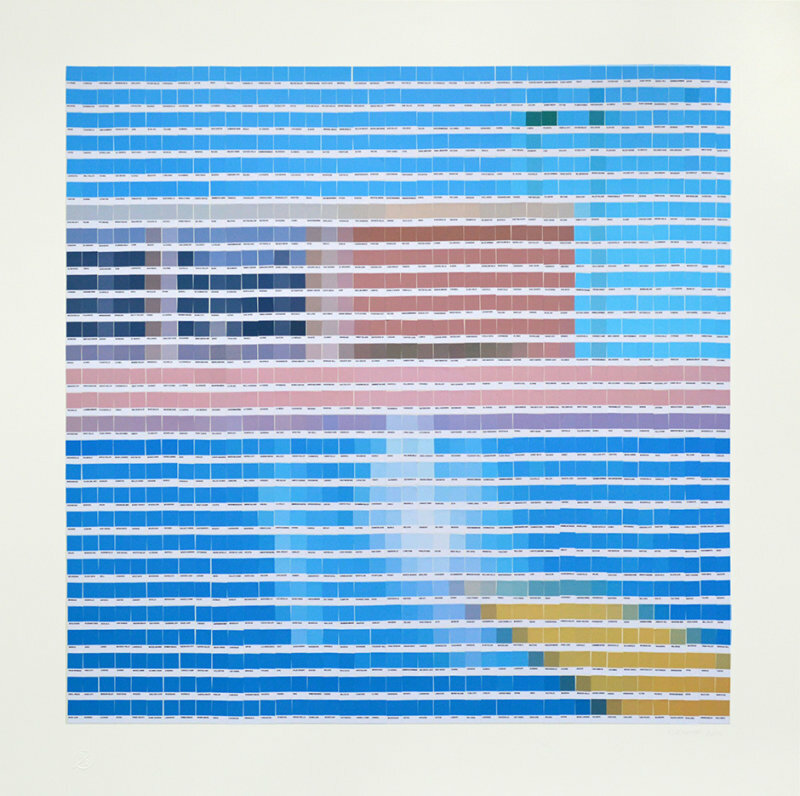 In Son of Man, the colour chips take on Magritte’s surreal 1946 self portrait; with each chip named using text from Brett Easton Ellis’s American Psycho, while in Bigger Splash, Hockney’s Californian summer is evoked by use of colour chips that are all named after the Golden State’s towns and districts. Smith’s work also illustrates the science of image reduction, how much information the eye requires for the brain to recognise an image, seen here in his colour-chip re-work of the Mona Lisa.